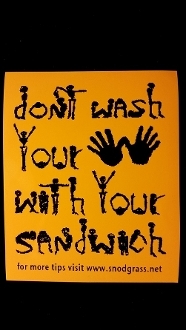 "Don't wash your hands with your sandwich". Some of Bob's wise words of advice that pertain to everyone! *Colors vary. 3¼"x4" or 2½"x2¾"
Copyright © 2012-2019 Snodgrass Family Glass. All rights reserved.